The Staples Center, located on Figueroa Street in the heart of downtown Los Angeles, is a multi-use entertainment venue. It is very easily accessible via the Los Angeles Metro subway and bus system or by a short walk from the areas many hotels and restaurants. There is always something going on in the Staples Center and it's very difficult to not find something to match your tastes. 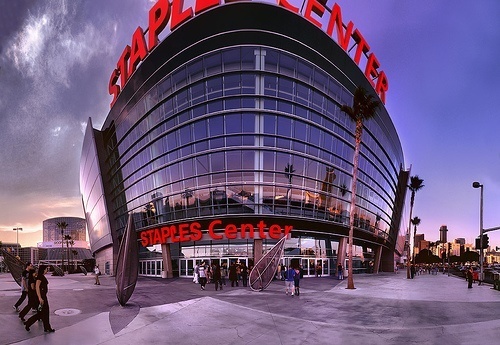 The Staples Center is primarily known as the home of the defending NBA Champion Los Angeles Lakers. While tickets for a Lakers game are usually difficult to come by, your sports cravings can be satisfied in other ways. The Staples Center also doubles as the home for the Los Angeles Clippers of the NBA and the Los Angeles Kings of the National Hockey League. Both are substantially easier to purchase than Lakers tickets. Recently heavyweight championship boxing has also returned to the Los Angeles area and is sure to return again in the near future. If sports aren't your thing, the Staples Center is frequently the home of major concerts including shows by Bon Jovi, Jay-Z, and Taylor Swift. WWE wrestling is also makes frequent stops at the Staples Center for major events including this past August SummerSlam pay-per-view and fanfest. The Staples Center is downtown Los Angeles premiere entertainment destination. The diversity of events and programs offered is top notch. There are also very few bad seats in the house. Like any other venue in the world the closer you are to the action the more you will pay to be there. But in the Staples Center even the cheap seats are usually good ones. Last updated by Kevin McRae on 11 February, 2010 in Destinations.